As a Handcrafter, you provide quality products, but you also provide a quality experience. For example, your customer could go to any big store and purchase a bar of generic soap; it would clean them, which is after all, the purpose. But, not only does your soap help them get clean, it also makes them feel good by smelling amazing, containing ingredients they can likely pronounce, and of course, looking fantastic. Providing the experience is key. Many people overlook the idea that bath and shower time don’t have to be exclusively utilitarian; it’s ok to take a few moments and pamper yourself, too. That’s why today, we’re going to talk about enhancing your customer’s bath with a few simple products! Bath teas, bathing teas or herbal baths are basically a combination of herbs, salts, oatmeal, etc. that are soaked in the bath tub before the bather enters. 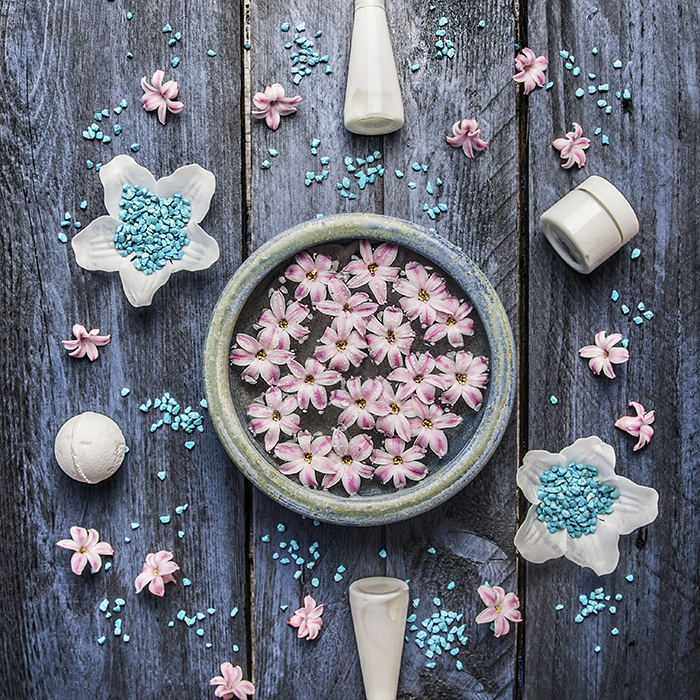 They give off pleasant aromas and can help enhance the feeling of well being and relaxation. They are not used for cleaning, exfoliating or moisturizing typically, but just for that enhanced experience. As cliché as it sounds, the composition of your tea is practically a limitless combination! Think of all of the wonderfully smelling herbs and botanicals that we enjoy in our soaps; now, let’s put them in a bath. Choose from dried botanicals like chamomile, eucalyptus, lavender, orange peel, geranium or calendula to name a few, and mix together in a mixing bowl. To package, either scoop the dried botanical mixture into a drawstring muslin bag, a large sealable tea bag, or into a mason jar that can be sealed shut. This gives your customer the option to either use the tea loose in the tub, or in an easy to discard bag. Many of us already use a few of these botanicals in soaps, so you may already have the ingredients to make a luxurious tea right at home! Just make sure to specify to your customers that your tea is for bathing, not ingesting. 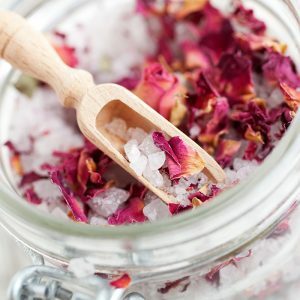 Another simple bath-enhancing product you can make is a bath soak. 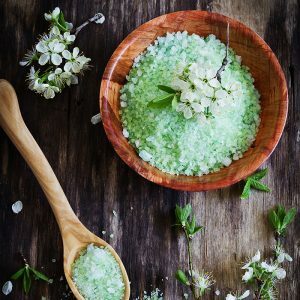 Bath soaks are exactly as they sound; your customer will add about a ½ cup of the salts to their bath and swirl them to dissolve, releasing fragrance into their bath. Soaks are a great way for a customer to enhance their experience, and make a great add-on product. Soaks are comprised of a salt of some type, usually Himalayan, sea salt, Epsom salt, Hawaiian black salt, etc. Then, you can add baking soda and an essential oil of your choice. To package, simply scoop your soak into a clean jar or container, and instruct your customer to scoop it into their tub; soaks are as simple as that! 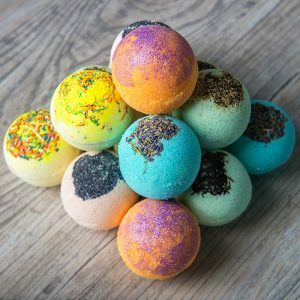 Bath bombs are all the rage lately, and it’s not difficult to see why! Fragrant and fizzy, these fun bath-time treasures are popular with bathers of all ages. Bath bombs are versatile and come in a number of shapes and sizes. We’ve seen everything from standard round bath bombs, to cupcakes and more! This is a very creative product, limited only by your imagination. Bath bombs are a mixture of baking soda, citric acid, a salt like Epsom, oils, and fragrance of your choosing. You can also choose to add skin-loving butters and oils for a luxe feel; think shea butter, cocoa butter and more. You’ll also be able to choose colors for your bath bombs; just make sure that they are approved for use in this product. For more information about how to make bath bombs, including a demonstration, check out our How To Make Fizzy Bath Bombs video in the HSCG How-To Library!. As the colder weather sets in, winter-weary muscles will be thankful for warm bath; make sure that your customers receive the ultimate relaxing experience by providing these great companion products to your standard offering. Ready to dive in? Find more helpful resources tailored to help expand your business, grow your product line and more in the HSCG How-To Library. Don’t forget to subscribe to Cut to the Trace to get notified when we post new content-there’s a new article each week!